Cliff Bleszinski muses on what he'd do in a (fully hypothetical) Firefly videogame. If Joss Whedon's fanbase were to evolve into a full-blown religion, its top commandment would be "Thou shalt love Firefly, for it is good". Even ten years after the promising sci-fi show was cancelled, fans continue to get excited over the slightest possibility of a series resurrection. 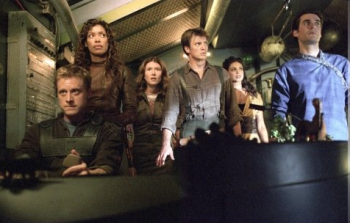 While a return of Firefly to television becomes more and more unlikely each passing year, continuing the story in other media has much better prospects. We've already got the Serenity movie and some fairly successful Dark Horse comic books, but Cliff Bleszinski thinks that a Firefly videogame would be an excellent logical step for the franchise. "Think about it," Bleszinski wrote to Kotaku. "The universe is ready to go. On one side you have the Alliance, on the other you have former Browncoats running smuggling operations, and both are terrified of the Reavers. With space combat, you could do first-person gunfights 'sci-fi Wild West' style on the ground with crazy escapes back to your shuttle, and everything in between." It's easy to imagine Bleszinski producing Gears of War or Unreal in the Firefly universe, but he actually believes that the core of the series was about emotion, not just action. "The crew of Firefly feels like a family," Bleszinski continues, "the final shots of some episodes showing them eating dinner together at a very retro table are there for a reason. One thing Joss has always been amazing at is portraying the motley crew that comes together as a family to overcome challenges." With that in mind, he thinks the actual game mechanics would need to adapt Firefly's western/sci-fi approach to action, as well as incorporating dialogue options similar to the Bioware's Mass Effect series. Of course, attempting to imagine the possibilities beyond that would reduce even the most hardened of developers into frothing fanboys, and Bleszinski is no exception. "[The] ship may be somewhat similar to the Normandy in Mass Effect, as well as some of the dialogue trees. Consider Kinect voice interactions with the crew to further push immersion, along with awesome Wing Commander-style dogfights and you can just SHUT UP AND TAKE MY MONEY." Bleszinski is only considering the Firefly game as a hypothetical situation, since to him, the logistics of partnering Epic Games with a licensed franchise lowers the game's chances to "darned near zero". Despite those concerns, Bleszinski went on to say that "the only external properties I would ever consider adapting to game form are Joss properties." Let's be honest: If Joss Whedon decided that Firefly would become a videogame, developers would get in line immediately just for the opportunity to discuss it. Even Minecraft's Marcus "Notch" Persson would be there, if his Twitter feed can be believed. So whether we see the Serenity flying through the latest Unreal Engine, or any engine, depends entirely upon the word of Whedon.